Combine the delicious dessert like flavours of vanilla with the health benefits of Gunpowder Green Tea leaves and what do you have? The Kent and Sussex Tea and Coffee Company’s very own Vanilla Green Tea. Not only can Green Tea leaves help to boost the metabolism, and thus improve your chances of losing weight, but the vanilla essence found in this brew can also help you to say “no” to that sugary pudding sitting in the freezer. After all, why would you pick fatty ice cream over an equally scrumptious beverage that offers, in many ways, the complete opposite. Vanilla Green Tea boasts sweet overtones with defined grassy notes. The sweet, creamy taste of vanilla infuses perfectly with this tea to provide a subtle, almost caramel-like character. Furthermore, when consumed as part of a healthy and active lifestyle, this beverage can also aid with cardiovascular health, and even reduce the risks of Type II Diabetes. And best of all there’s no catch. Gunpowder Tea, flavoured or unflavoured, is quite literally steeped in mystery. To this day, no one really knows its true origins. The only thing that’s known for sure is how it's made: tea leaves and young buds are rolled into small, round pellets which resemble the lead shots used in early muskets. This is the likely origin of its name, although another theory suggests that it stems from the Mandarin Chinese phrase, “freshly brewed”. When spoken in the correct dialect, the phrase “freshly brewed” sounds like the English word, “gunpowder”. There is even one other admittedly ambiguous theory which suggests that Gunpowder Tea owes its name to the ‘cracking sound’ it makes when brewed, similar to the ‘crack’ of a musket. It’s likely we’ll never know for sure. Historians largely, although not exclusively, agree that Gunpowder Tea first originated from the Zhejiang province of China during the Tang Dynasty (618-907 CE). Again, this is another example of speculation as only limited records exist. Today, however, the Zhejiang province is arguably the most important province for Gunpowder Tea production. Other provinces known for producing Gunpowder Tea include Guangdong, Anhui, Hunan, and Fujian. Interestingly, up until 1900, Chinese Gunpowder Tea accounted for around 60% of America’s total tea imports! Tasting Notes: Vanilla Green Tea is a wonderful infusion of flavours. 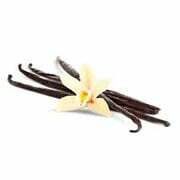 Enjoy sweet, creamy, indulgent notes of vanilla with every sip, coupled with equally delicious grassy undertones. Smooth to the last drop, this beverage is delightful in every sense of the world. Colour in Cup: Vibrant golden-yellow liquor, light in tone. Health Benefits: Vanilla Green Tea contains high concentrations of an incredible antioxidant compound called Epigallocatechin Gallate (EGCG). This compound is known to have powerful metabolism-boosting properties which can help you to lose weight. Every time you eat, enzymes in the body’s cells break down food and turn it into energy. Broadly speaking, the metabolism is essentially the process of food-energy conversion. Ultimately, the faster your metabolism runs, the more calories you will burn; the more calories you burn, the easier it is to drop those pesky pounds. Looking to achieve the perfect summer body? Start with Vanilla Green Tea.